I am to the point that I hesitate to even post on DNA groups because I have to ask myself “What am I even asking?” The answer is Everything. I do read and try to study. The old brain doesn’t comprehend the way I want it to. Part of it is, when I’m online, I’m also cooking, telling small child to get off the dog, getting clothes ready etc etc etc. That is not going to change anytime soon. My concentration and focus will, I hope and soon. 🙂 I know more than I did yesterday but not much when it comes to DNA. I did a segment search on GEDmatch and thought it was just the neatest thing, except I had no idea how to save or analyze the report. I noted who matched on what chromosome then got confused as too how many chromosomes they matched on and how much they matched on each one. I was looking for patterns. I took a look at haplogroups and found some other U5 s. Yeah, I confused myself. I’m doing stuff over my head right now. When I get like that I go back. it seems logical to just go back to the beginning and try to put things into proportion. My second cousin is going to help after the holidays. She doesn’t want to wreck anyone’s life with the knowledge of my existence. Not being funny here, it’s just the way it is. I know that we share a common great grandparent. Or two g grandparents? I wonder if we only share one grandparent if that would change things? It seems someone perhaps stepped out/cheated. Or did something out of wedlock. Which means we don’t share a set of anything. We are in the same generation. See how my thought process is (lacking)??? 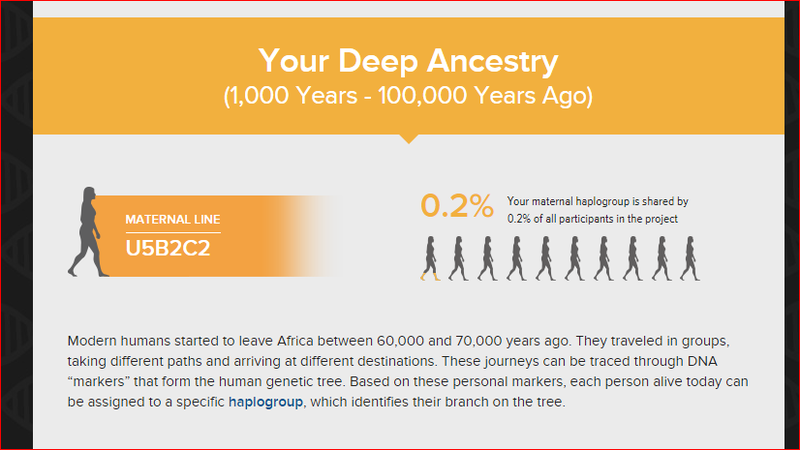 So I’m wondering since we are a 204.4 or so cM (ftdna stopped rounding things off) If we are connected by one grandparent and not 2 great grandparents. Can’t get my head around that. My search Angels have all but passed out. I have two. They work in different ways and I try to let them know what the other is doing. One is not a search angel really, she works data bases sort of. The other is more of a genealogist that is learning DNA as well. Me, I’m all over the place but I feel that is needed sometimes. There are tried and true methods in searching, but in my case, they haven’t worked. Both of these people feel that non id info is correct for the most part. I’ve heard that it’s way off a lot of times by reunited adoptees. I question if they are actually reunited with the right person because of my own “match” 14 years ago. I don’t know, but I do know one or two years difference in age or dates can be huge. I know that I have no matches anywhere near Syracuse. A few that may have wondered through though. It’s break time or time to break. I quit a lot of search and reunion groups. Some because I really can’t take some of the cat fights. Some because of the people that expect …..everything. I’d be happy with a name and photo. I really would. I simply do just want to know. I’d be thrilled if there was an alive sibling who wanted to meet, but I would not DEMAND it, nor would I Whine if that isn’t possible. I quit one that just seemed like a huge clique. I’m at the stage in life that I find it hard to welcome negativity with opened arms. I quit some because I was simply on a roll with quitting groups that were non active, people griping or full of spam. I quit one that ignored the hell out of me lol (I kept the friends that I made on there though) I stayed in 2 that actually seem to be keeping up on spam and hate. Some of the groups have members that think because my mother is supposedly dead that I am not a real adoptee. They feel that because my search isn’t mutual that it’s ridiculous. I do admit that at times, I think they are the ones that are ridiculous….them, with their names and locations and exact dates and their maps to the front doors of their family that scream and post after an hour of searching of how remarkable it was to “find” them. Then their screaming and demanding that they be welcomed and etc etc. Sometimes I want to cyber yell at them “You,you,you NAME PERSON!” lol In all seriousness, I don’t feel this way often or for a long time, but when I’m treated as the one that Actually doesn’t have the right to know, I do feel this way. I’ve had enough people in my life feel that I’m undeserving of anything at all ever, I don’t need to take it from fellow adoptees…or fellow anythings. I don’t dish it out, I don’t want to take it. Right after I check on a few more things. Really, just a few more things. Through my searching I think I may have found the real Angela Marie. I sent the link to her possible birth mom who is going to go shopping and running errands first????? I don’t know. It sure looks like her. Angela Marie is the person who we (myself, birth mom, and many search angels) thought I was. Turns out, I was not. 14 years later, I find this out. We did DNA back then but it was only 3 markers. We ARE NOT a match. We fell for the whole 100% motherhood confirmation thing. I jumped right back into searching so that I wouldn’t actually feel the weight of this news. My Ex natural mother (so to speak) has since done the DNA kit I sent her and is now (after running errands today) going to resume her search. I hope she has quick results. I hope she actually clicks on the link I sent her to the adoptee born on the day i was born in the same state. This woman looks more like her too. I believe it’s the one I sent her 14 years ago (her listing–no facebook at the time) that she said wasn’t her Angela Marie. Maybe it’s not, but it looks like the perfect cross between her and the birth father. It would be so nice if it is a match. Except for the fact she didn’t check it out when I first sent the link to her search query. I had to look up the correct spelling of Leper. via Only U.S. leper colony faces uncertain future : Scientific advances, budget cuts could close the Louisiana facility. – Los Angeles Times. So I found the above interesting article. Also, I know how to spell what I feel like. I joined a group for adoptees and paid 5o bux to do so. They have a facebook group that they added me to. The thing is (there is always a thing isn’t there?) I feel like I’m being stopped in a junior high hallway without a hall pass. I thought I’d share some of my updates and ask a question (like all the cool members do) I was met with “Are you a member?” Yes i gave you money and we talked back and forth. My facebook addy is the same as my email so there shouldn’t be any confusion there. I didn’t say all that, I simply said “Yes”. Then I was met with “Did you post to our group?” uh, you’re reading it, right? But no, I answered “This is the right group isn’t it?” No answer. In fact, no response from anyone. I went through and read the other members post and they were all met with friendly responses and helpful/supportive replies. Mine seemed to fit in ok but for some reason, i was shunned like a leper. So I paid to be an outcast. A horrible outcast to which should be shunned. I deleted my post along with the comments. I have no idea what the heck the group is for and why only certain people can post. I wonder if there is anyone else who gets this? if not, it’s nice to be unique but I’d prefer to at least know the reason. If it’s a clique than they shouldn’t charge new members. I have no idea what to think. I must have over looked some social cue. I shouldn’t have to (nor should anyone else) be that careful. Walk on eggshells and do detective work in order to properly post in a FB group? Really? I’m feeling a tad sensitive perhaps. The last place you’d think you’d get this is an adoptee group. Don’t we encounter enough of this in other areas of life? Do we have to get this within an adoptee group? It should be some form of safe haven. I can go anywhere to be rejected, I don’t need to take it there lol I’ll get over it, of course, but I’m somewhat of an introvert to begin with. Blatant rejection for no apparent reason or for mere sport doesn’t set well. I got a good 2nd cousin match 204 shared cM. Since she is a live person and may want to shun me later at some time lol I will refer to her as BigW. She is a pro genealogist. She emails back here and there but I try not to pester her too much. She did express after comparing “our in common with” matches and so forth that she felt it would be between two son’s of her great aunt’s. i can’t seem to find them per se but I did figure out that her great Aunt is only a half sib of her grandmother. A person who knows DNA better than I do (as does most of the world I fear) took a look and decided we can exclude her paternal grandfather because of our x matches on the chromo browser. Also note BigW and I both only did Family Finder (FF) on FTDNA. So we were down to 3 of her grandparents. We still don’t know if we are looking for my mother or father at this point. Nor do we know if it’s her paternal grandmother or one of her maternal grandparents (both). It is likely, accordiing to her that my Father is coming from one of her Great Half aunt’s sons. I’ve been playing around with my matches. My next highest matches 72cM down to about 65cM do not match BigW. I’m going through and making notes on certain things such as an Unknown Father, Adoptees and NYS. Alot of surnames show up in my matches. The problem is, if my highest match is my father than the mother could be anyone. 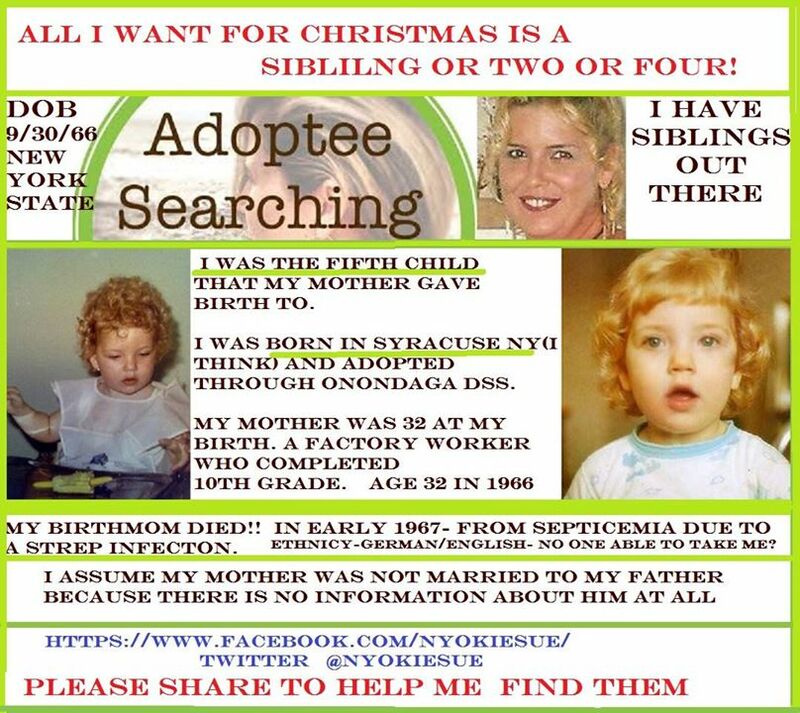 Another thing is no one has ties to Syracuse except one that could be my grandmother (if it’s the right identity) She had left to stay with her aunt and uncle at the age of 16. They did live in Syracuse and it’s a common name of REED. She would have had just enough time to give birth to a child that had just enough time to have one of my parents in the 1930’s. That is a complication right there. One, it gets rid of the two boys (which would be older sibs to this person) and two, The baby she had would have been out of wedlock and most likely relinquished. No name. But, DNA. This child or it’s offspring would not have name attached to any tree of theirs. Even a census would show only the new legal name. If the child was on a census under “border” it would still be that families census name. It would be hard for a family to miss a female family member with 4 children even if she gave up the fifth. However, any male family member could go out and make a baby or two. Easy to miss with that. That is why everyone feels it must be a male in their family. My matches that don’t match her don’t necessarily mean they are my opposite parent’s line. Or does it? That is the data I’m playing around with right now and I’ll tell you, I’m confused to say the least. When it becomes clear, something throws off what ever theory i develop. I am reading and understanding DNA itself more and more. The genealogy is just as confusing with the way people record events. Dates names and places are sometimes off. Hard to get good documentation at times AND connect to trees and so forth. When I get a little further i’m going through my notes (old skool notebooks) and I’m putting together a private tree. I’ll take it public for a few minutes at a time to get “hints” then make it private again. It will be called “The Iffy Family Tree” that will help. These people i’m dealing with are not fellow adoptees in search so I have to be careful. They may be birth families in hiding for all I know. The ones doing genetic genealogy though should be pretty welcoming. But not definitely so. One of my 3rd cousins seems to also think it’s my father that connects us BUT she does not match BigW or anyone I have in common with her. This 3rd cousin we will call WAGNER. She was very helpful, even sending me a file to keep handy to look for 4th cousin names. 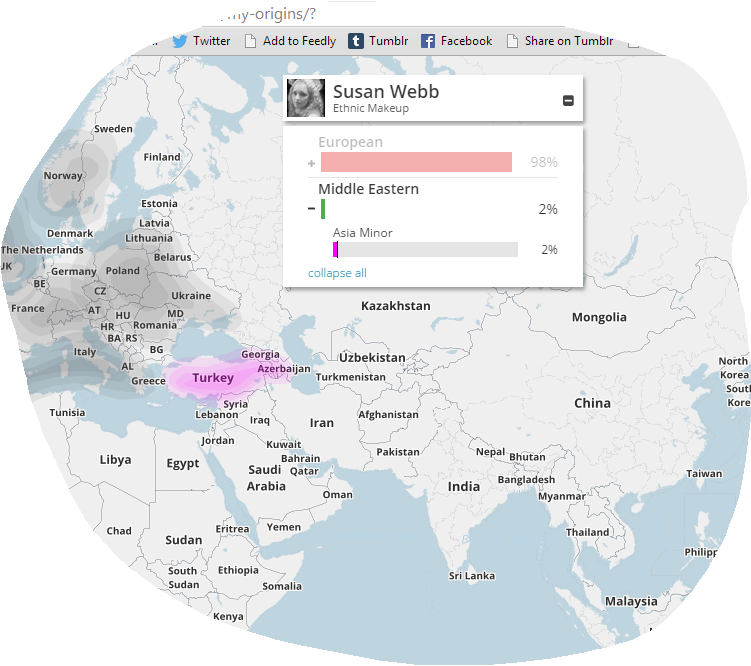 She even matched me on myorigins and provided a possible reason for my 2% Turkish thing. She is 4%. Which she has closer ties to the Dutchman that did it lol WAGNER actually emailed me before I had even seen my results so I feel more welcomed to ask her questions as they come up. I feel so much closer. I at least feel that in my children’s lifetime if they pursue this, they will find their grand parents. I have REED PORTER KETCHAM WEST WHAM RICE WEBB RUT CLARK KENT and RUT in abundance as far as ancestral surnames. I have found no one who matches my mother as far as her lifespan 1934-1967. There isn’t a lot from NY either. Doesn’t mean anything yet. I’m thinking of having a couple of my kids tested. The boys will go back to their own father’s family so that won’t do me much good on the ydna. But maybe my daughters? With FF I know they have at least half me in them all so maybe we can compare plus it would be nice to have a known relative on there. Looking for Likes in all the wrong places…..
That was good advice but they are up just the same. It’s not hard to though compared to how low they were. 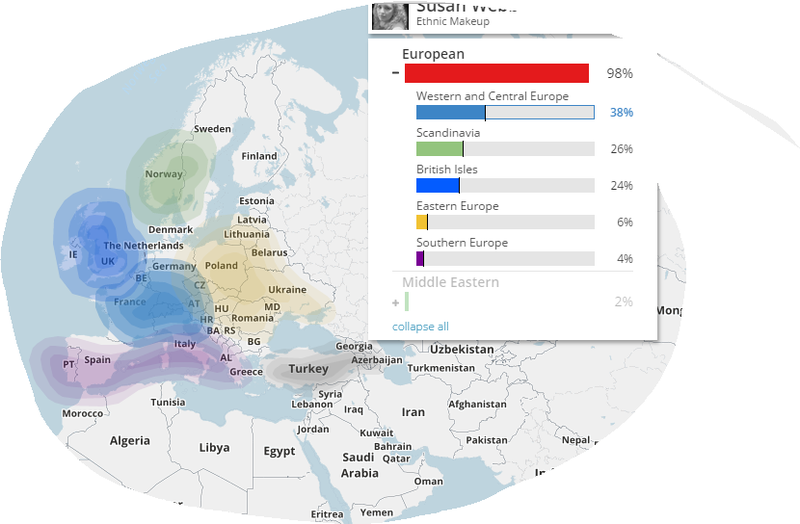 My results have not posted yet BUT my origins part did. That means it’s any day now. So …no I’m not Irish and Italian anymore. But I’m not German/English either….necessarily. 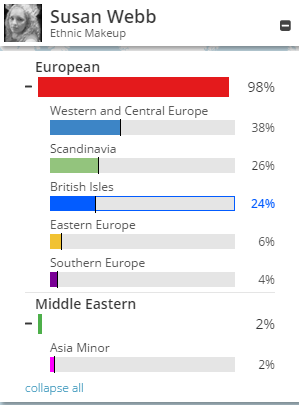 I’m 98% European and 2% Middle East. Looks like Some German and Scandinavian mostly. This isn’t a real specific test I’m sure but it gives an idea. I’ve got project matches as a result already. Not people matches yet but groups. That is still good and helpful for my journey. My mother’s death was due to Septicemia caused by streptococcal infection origin unknown. Seems like she may have had another child after me in 1967. It depends how “early” in 1967 she died. My info seems off so she may have died quite late in 1967. If that is the case than it is likely she had another child and died shortly after child birth. She had a healthy full term pregnancy with me, an 8 lb 2 oz child, so It makes sense she may have died later in the year of 1967 after having a preemie or abortion (natural or induced). They changed/reassigned all/most the Cause of Deaths in the 60’s and prior from Septicemia to other things. That’s why it may be important for me to search with broader causes such as “brief illness” “fever” etc. Something causes the sepsis in other words. If she passed away in “early 1967” then it is still possible she got pregnant again and miscarried (natural abortion) and died from infection. This makes sense but so does toughing it out for months after I was born. She would have to have died in January 1967. 1. because that would be long enough to suffer from my birth and 2. because the state is stupid and “early” would have to be the first sign of “early” Which would be January. Early should mean 1-4 (jan-apr) based on a 12 month year containing early, mid, and late. But look who we are dealing with? The “reporter” of these facts may also be a cut and dry type, going by early and late. First 5.5 months being early and Last 5.5 months being late. If she died closer to mid or late 1967 then there was enough time for the theory of another child to be true. Getting pregnant early after giving birth might have led her to a botched abortion which especially back then would be almost certain sepsis. It is certainly something to consider and adds more to my search. Anything is possible even if improbable. It’s hard playing this guessing game with my life and my family. They (the state of ny) should really be held accountable. Perhaps liable for upholding these biased hateful crazy laws. Information recorded is only as good as the reporter. They could have scratched any old thing down knowing that it will be sealed and secret and no one will ever find out. Or so they thought. Shame on all of them involved. Unknown is far better than incorrect data. Integrity regardless of amount of pay or weight of work load is vital. WHAT IS THE REAL MEANING OF “MAKE AMERICA GREAT AGAIN”? "Hi Everyone, My name is Leticia, This is the corner where you can find the Creations of My Hands, Heart and Mind. I will be writing about My Current Crochet Projects That I am Working on. Musings on music from the desk of Paul Myers. Uprooted and transplanted. Digging deeper into adoption from the perspective of an adoptee/first mother.